In this delicious post, Brian Emmett, winner of CBS’s The American Baking Competition, shares his favorite summery dessert recipe just in time for the warm weather. His first cookbook, Get Your Bake On: Savory and Sweet Recipes from My Home to Yours, is available in print and ebook now. I’m one of those crazy people who makes their own birthday cake. Although it may sound strange, I want to make sure it’s going to be exactly what I want on my big day. This trifle cake is my long-standing birthday choice and as my family will attest, it makes a grand statement every year! To make a big fanfare of the presentation, use sparkler candles and lots of mixed berries for garnish. Preheat the oven to 350ºF and place the rack in the center. Butter and lightly flour a 9 x 13-inch baking pan. In a medium bowl, sift together the cake flour, baking powder, and salt; set aside. In the bowl of a standing mixer fitted with the paddle attachment, beat the butter on medium speed. Add the sugar and beat until light and fluffy, 2 to 3 minutes. Add the eggs one at a time, blending completely after each addition and scraping down the bowl as necessary with a rubber spatula. Add the vanilla and berry extracts, then reduce the mixer speed to low. Add the flour mixture and the milk alternately in three additions, beginning and ending with the flour. Pour the batter into the prepared pan and bake for 20 to 25 minutes, or until a toothpick or cake tester inserted into the center comes out clean. In a medium bowl, combine the gelatin mix with 2 cups hot water and add Chambord, if using. Let cake cool completely in pan, and leave cake in pan as you begin to decorate. Use a toothpick to prick holes into the top of the cake and then pour the gelatin mixture completely over it. Top the cake with vanilla pudding, then whipped cream. Decorate with mixed berries and serve. 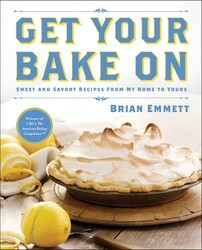 Cook up some delicious, down-home goodness with this cookbook of more than seventy-five sweet and savory recipes from Brian Emmett, grand prize winner of CBS's The American Baking Competition. I going to have to try this recipe during the summer! It looks so good. I definitely have to try this recipe!